When you're craving potato chips but looking to keep your intake of acrylamide and empty calories to a minimum, see if you can satisfy your need for salty and crispy with kale chips. That's right - chips made with nutrient-dense kale. Just wash and dry a large bunch of kale, tear into bite-size pieces, toss with extra-virgin olive oil, season, then bake until they're delightfully crispy. Instead of flooding your body with deep-fried sugar, you'll nourish your cells with a plethora of health-enhancing nutrients, including cancer-fighting carotenoids, natural vitamin C, and bone-building minerals like calcium, magnesium, and vitamin K. Unbeknownst to many, kale is also a decent source of omega-3 fatty acids that nourish your nervous and cardiovascular systems. The key to getting the most out of kale, as is the case with many tough, fibrous vegetables, is to cook it to soften its natural fibers. 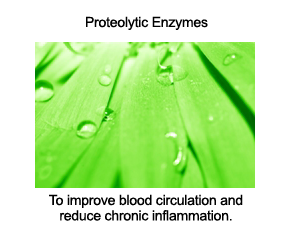 This helps your digestive tract better extract the nutrients from within. 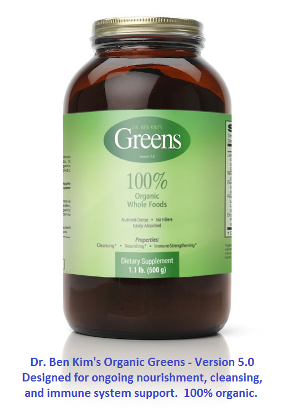 Tough raw vegetables, especially cruciferous ones like broccoli, cauliflower, and cabbage, can travel through your digestive tract without too many of their nutrients entering your bloodstream unless you soften their fibers to allow for easier extraction of vitamins, minerals, and other phytonutrients. Let's have a look at how to make a batch of healthy kale chips for pennies per pound. 1. Pre-heat oven to 250 degrees Fahrenheit. 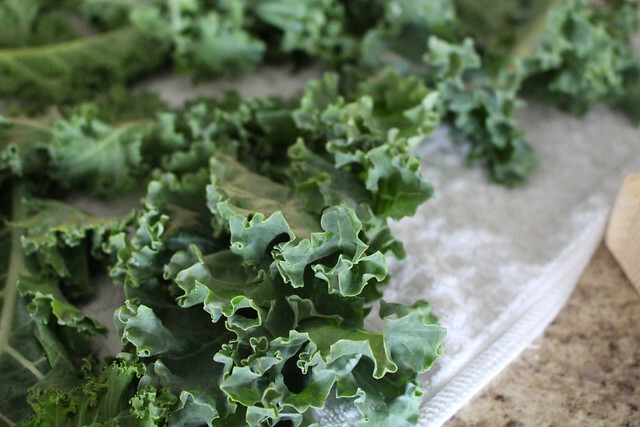 Wash kale under cold water, then pat dry thoroughly with a dish towel or paper towels. Tear into relatively large, bite-size pieces, then pat dry again. 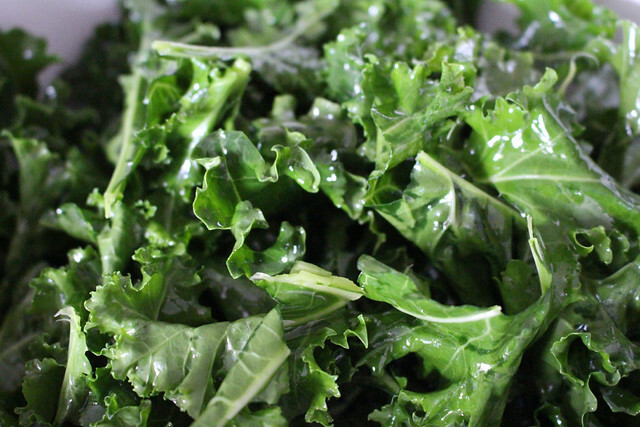 You want to be sure that your kale is dry before baking to ensure crispy kale chips. 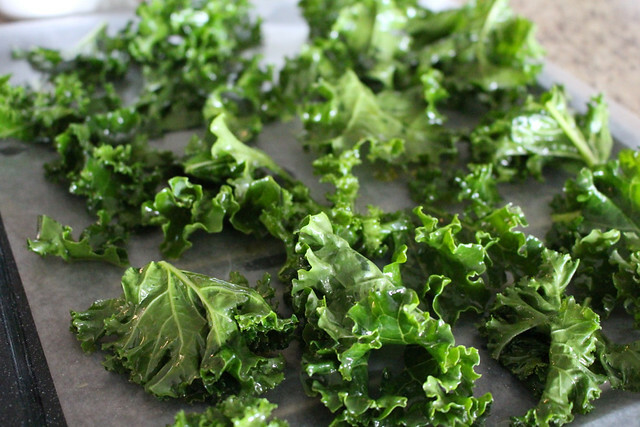 If they're wet, you'll end up with soft kale chips that aren't too different from steamed kale. 2. Toss dried kale pieces in about two tablespoons of extra-virgin olive oil. Be sure not to use more than this, and toss gently until all pieces are lightly coated with olive oil. 3. 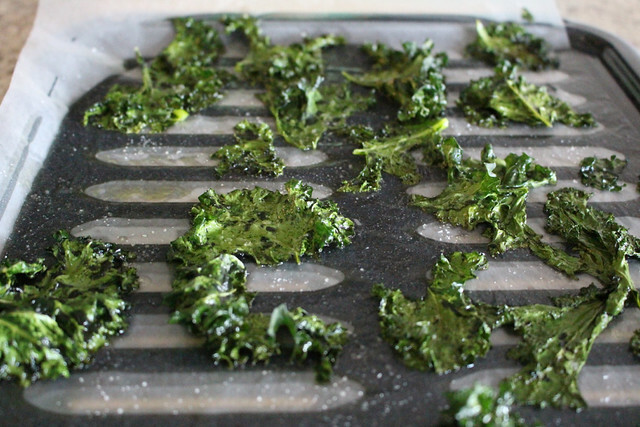 Arrange kale pieces in a single layer on wax paper on a baking tray. You may need two or three trays for one large bunch of kale, as you don't want the pieces overlapping. The pieces will shrink a bit as they're baking, and if you ensure that each piece has its own little space, you'll get that coveted crispy effect. 4. Once arranged on baking trays, add sea salt and any other seasonings you enjoy. But add less than you think you would like, as the pieces will come out quite thin (just like store-bought potato chips) when they're done cooking, so a little seasoning goes a long way. Onion powder, garlic powder, and even cayenne pepper are nice options - remember, just the lightest dusting is all you need for good flavour. Bake for 30 to 35 minutes at 250 degrees Fahrenheit, but check on kale frequently beginning at the 25 minute mark - cook until they are crisp but still dark green. If they are still soft, keep on baking. If they are brown, you've gone too long. Each tray should be baked separately so that the kale pieces crisp up properly. Once crisp, serve and enjoy immediately. If you've ever had seasoned dry seaweed (called kheem in Korean), you may find kale chips to be similar in flavour and texture. Hope you have a chance to try and enjoy. Nutritional yeast is a wonderful seasoning. Sometimes I sprinkle in some cumin but have found kale chips taste best with nutritional yeast, little sea salt. Great post. How would you do it in a dehydrator? I like your recommendation of alternative salt choices, onion salt or maybe herb salt would be good. I can definitely say it's easy to use too much salt with normal plain salt. My room-mate tried a couple of months ago, and it was way too strong, almost like eating crunchy sea-water. (She made them by trial, not to any recipe) Within minutes of eating one small piece each we were reaching for the milk. Maybe now we'll be brave enough to try again with the alternative flavourings. Thanks Dr Kim.